The only possible send-off that could be better for Mellon Arena would be watching the team hoisting the Stanley Cup on home ice in a few months, which has never happened in the building's history. But if that doesn't happen, no one will forget last night's events anytime soon. A dramatic pregame video montage and subsequent ceremony featuring more than 50 former players, coaches, and executives would have been worth the cost of admission itself. 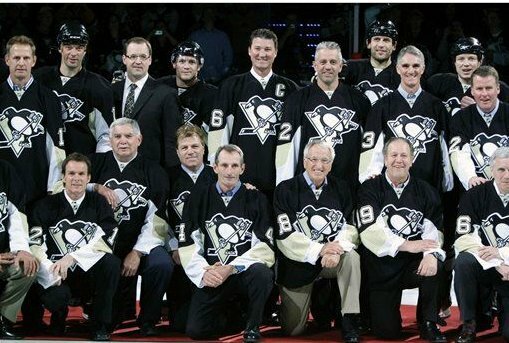 To see so many team greats from the past connecting with the stars of today was truly magical, as was one final shot of Mario Lemieux in a 66 jersey on Mellon Arena ice. I was glad to see sometimes-maligned former GM Craig Patrick in the house, and equally enthused at his reception from the Mellon Arena faithful. And to cap things off, everyone involved, including the current players, took part in an organization photo at center ice. Like I said, you could've stopped it right there and people would've left happy. Luckily, there was a hockey game on top of the ceremony, and what a game it was. The combination of the night's emotion, the return of Evgeni Malkin, and the less-than-intimidating opponent was the perfect storm on this occasion, as the Pens skated off with a 7-3 win over the New York Islanders. Brooks Orpik must've really been fired up, because he started the scoring just 23 seconds into the game, one of six goals in a wild first period. Sidney Crosby once again rose to the occasion under the bright lights, scoring his 49th and 50th goal, although the second was later credited to Bill Guerin. King Crosby would end the night with four points and 501 for his career - the third-fastest to that milestone, behind two guys named Gretzky and Lemieux. Marc-Andre Fleury settled down after the first period and made some incredible saves in net, and Malkin scored on a first-period breakaway to help the Penguin cause. Guerin would also finish with two goals and an assist after the Crosby goal credit was re-assigned. 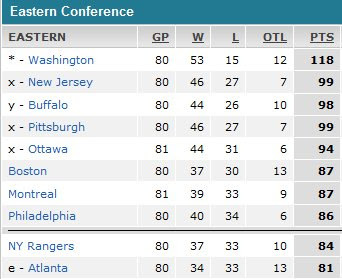 It's also worth noting that the Penguins actually won the game, which is kind of important when playoff seeding is on the line. The Pens finish the regular season with roadies against Atlanta and the Islanders this weekend, with a shot to vault up the conference standings within their reach. Does anyone have a picture of the guy who had the Talbot shhhh tattoo on his calf? I need to send that to some select people in Philly. My cousin's friend got a custom made jersey with a "SSHHHHH" on the nameplate and jersey # 25. It is legendary. I livein Philly too so I could not be happier with that sort of innovation/ creativity. Am i the only one who thinks that Gary Roberts was undeserving of being honored before the game? I mean, i know he lost his virginity before his father did 'n all, but is he really a penguin 'great'? I don't have a problem with Gary Roberts being there. Sure, there are probably other players that are arguably a little more deserving, but he is a crowd favorite and I think inviting him back shows the kind of respect the organization has for him. I mean, if you want to nit pick Dave Hannan was there too. I think Roberts is a slightly more decorated NHL veteran even if his better years were played elsewhere. Personally, I was sort of hoping for a Rod Buskas sighting. However Gary Rissling being there made up for it. I didn't have a big problem with Gary. He was a memorable Penguins, and although it was fairly recent, he was also available (unlike other recent players like Jagr, Ryan Malone, and Scuderi, who were very deserving, but are also busy still playing). It would've been great to see Jagr at the Igloo one last time though.